The best hug I received at CAF came from Gary Gill, when I arrived. The second best hug came from the towering and lovable Klaus Bunge of Odyssey Audio. Klaus has such an unpretentious demeanor and down-to-earth (but worldly) grin: with Klaus, I could hang and talk and listen to his gear all day. 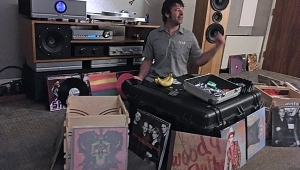 Every time I visit an Odyssey room, the amplifiers, DACs, and speakers let the music present itself in a highly detailedbut warm and human-centeredway, just like Klaus himself. In fact, I think the "embracing" nature of the Odyssey sound may cause its less obvious accuracy and neutrality to sneak in under our audiophile radar. To me, it feels like Odyssey is not getting the media credit and attention it deserves: Klaus's stuff rocks real music, real hard, and it feels like Bunge is giving it away for free. The room was crowded but the sound was, as usual, big and natural. 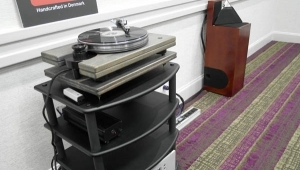 This is the gear I listened to: Candela tube preamplifier ($1600), Khartago Mono amplifiers ($1995/pair), the new Suspiro phono stage ($1250), Kismet loudspeakers ($4200/pair), and last but massively not least, the giant Massive Rocks Furniture equipment rack. Long ago, I was the importer for Audio Note products from both Japan and the UK. Therefore, I well understand that AN UK is an international purveyor of high-class, musically sophisticated equipment, designed to appeal to people of refined taste and discrimination. So: what's up with the Sharpie scrawlings on computer-printer paper taped to the fronts of the $4500 AN-J/Lx loudspeakers? Why is this "Below Best Buy" sales strategy used to cover Audio Note's phenomenally musical parallel-single-ended 6L6 amplifier, the P2-SE ($4500), as well as their DAC 2.1X ($4000)? Each of these components represents a long-struggled-for engineering triumph! I am unquestionably biased, but I think these components deserve a more respectful approach to lighting and display. 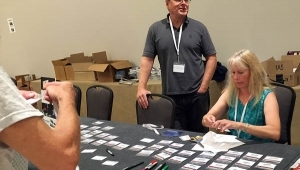 David Copewho used to conduct beautiful demonstrations for Audio Noteis now involved in Audio Note's newly formed recording company, Audio Note Music. I asked the person in charge of the company's CAF2016 exhibit for an information sheet on pricing, and he pointed and replied gruffly, "Look over there!" Immediately, I knew what was up with the printer paper. not so vivid, but very much alive! I am forever a fan of ATC loudspeakers. Their midrange domes are the greatest, and the company sound is accuracy definedbut without any loss of musicality or fun factor. 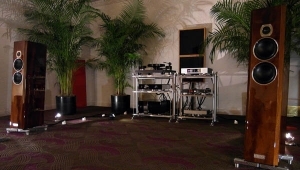 In the PrismSound room at CAF2016, the ATC SM 40A loudspeakers ($14,000/pair) were singing very pretty songs while driven by the charming Callia (by Prism Sound) USB DAC/preamp/headphone amplifier ($2595), connected with Atlas Cables. 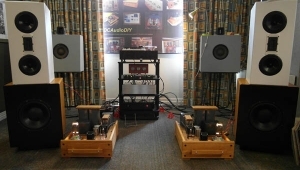 I always feel bad for LKV Research: their LKV Veros One ($6500) and Phono 2-SB ($3000) phono preamplifiers have yet to receive all the respect they deserve. But maybe that's their own fault: Both products are quiet, well-spoken, charming, and well-mannered. Their efforts never jump out and grab your attention. I am most familiar with the Veros One, which always just rolls along, playing black discs with a subtle but sure magic. Every system I have experienced with an LKV phono stage preamplifier feels o r g a n i c.
And today, listening to the Veros One, with the LKV Research Line One line-level preamplifier ($3500) driving the Conrad-Johnson Premier Eleven power amplifier, itself connected to a pair of Joseph Audio Pulsar speakers ($7700), I experienced that exact same organic-ness. When I use the word organic as an adjective in an audio context, I mean it just like the food term: rich, tasty, right, and natural. For my analog audio palate, no phono stage or cartridge can achieve "reference" status without that Certified Organic label attachedand the LKV Veros One has earned it. A fine time was had by allespecially the winners of the "Best-Dressed" award, Glen and Ivy! peace and crickets. See you next year! Mavis Staples has been touring with Bob Dylan and lately she has added the Buffalo Springfield classic (with enthusiastic audience participation) to her set. As Thunderclap Newman would say, "There's something in the air." What is the giant chrome box on the bottom of Klaus' rack? I'm assuming the one above the preamp is his new phono stage...could this be some sort of AC conditioner? Herb, I was pleased to discover that our Veros One is organic. My daughters, who pay attention to these things, will probably have greater respect for what I do and will certainly be more willing to eat what I make when they visit. But on a serious note, thank you for the quote from 1966. Some things really are important. Herb, I enjoyed your (and Art's) show report. Do you think you'll ever give a formal review of a power amp and/or pre-amp from Odyssey? and that is my plan . 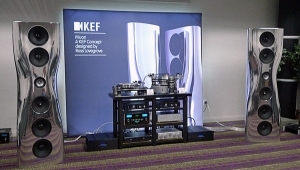 . . Odyssey amps were powering the giant KEF Muon loudspeakers in the KEF/VPI room ! 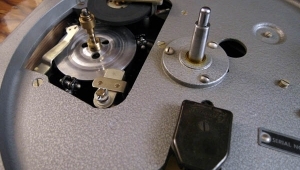 Happy to read your text about Klaus Bunge and the Odyssey Audio. 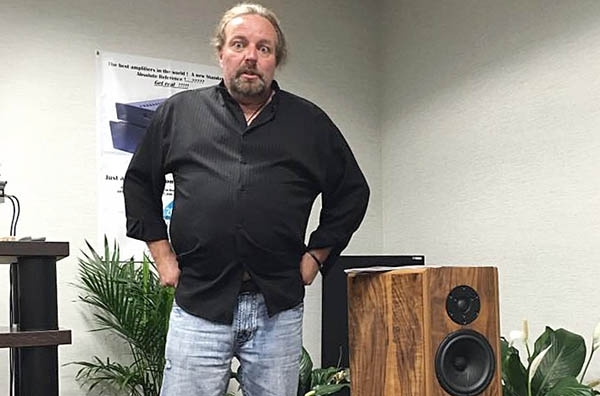 I can't agree more; Klaus has a wonderful personality and Odyssey Audio's products deserve much more attention. I met with Klaus, for the third year in a row, at T.H.E. Show Newport here in Irvine to update him about the progress of the Hi-Reality Project. 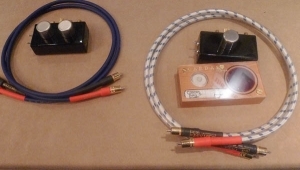 We are using a pair of Odyssey Audio Khartago Mono Extremes amps to power Sjöfn Hifi (the clue) which together serve some of the audio aspects of our prototype.